Don’t let the recent cool weather fool you into thinking the fishing is over until spring! 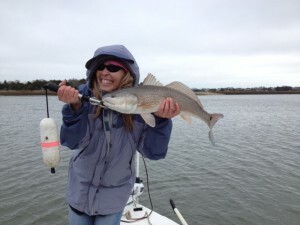 On most of our trips we have had good catches of Redfish and Trout. 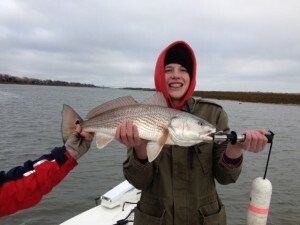 We have been hanging around the flats and feeder creeks at the lower tide stages to target schools of active Redfish. Most often we have found them cruising edges of oyster beds and grass in search of easy prey. We have targeted those fish with a variety of Z-Man and DOA swim baits on light jigs and flutter hooks. We have also used cut mullet and blue crab on a 3/0 circle hook with just enough split shot weights to hold it in place. The reds can get wary this time of year, so if you have a few fish pick up your bait and drop it then it’s time to downsize those rigs. Trout have been responding well in 8 to 15 ft of moving water near drop offs and channel ledges. We have been “dead sticking” DOA shrimp and Z-Man Streak Z’s for those fish. When we dead stick a bait we simply rig it with a 1/8 or 1/16 oz jig head or weighted hook. Then cast it up current and let it drift down current. I usually experiment with hopping it or just lifting it off the bottom every 15 seconds or so until it draws a strike. 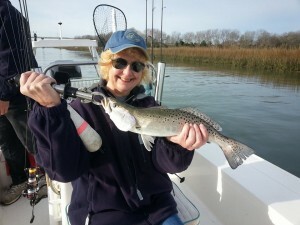 The same technique can be used with live bait or a popping cork with a long leader. Sheepshead fishing is on my list this week so check my blog and Face Book page for the most recent reports. I have a full week coming up, I hope one of the trips is yours!